Wellington v Nelson – Professor Bruce Collins – 16th November 2015. When I real­ised that it was my turn to write the blog and the sub­ject was his­tory I was filled with dread because it was my weak­est sub­ject at school. However I was grabbed by the present­a­tion given by Professor Collins. His sub­ject is modern his­tory and he has writ­ten many books on the sub­ject. His place of work is the Sheffield Hallam University and his talk was a com­par­ison of the lives and careers of two “English” heroes in the Napoleonic Wars, namely The Duke of Wellington and Admiral Lord Nelson. The word English is in quotes because in actual fact the Duke of Wellington was Irish. I am not going to real off any dates because they went com­pletely over my head, but these two men were heroes in the Napoleonic Wars. The Duke of Wellington’s career was in the army and, as every­body knows Nelson’s career was in the Royal Navy. Nelson’s family were from the clergy and his uncle was a sea cap­tain which gave him his intro­duc­tion into the the Royal Navy. The Duke of Wellington, or Arthur Wellesley as he was called was born into an aris­to­cratic, Irish family and part of his edu­ca­tion and train­ing was obtained at the French Royal Academy of Equitation, where he became a first class horse­man and learnt to speak French flu­ently. He was gaz­etted into the army as an ensign by the 4th Duke of Rutland (Lord Lieutenant of Ireland) and reached the rank of Lieutenant by the time he was 21. Nelson’s uncle was chair­man of the board and he used his uncle’s influ­ence to get on many ships so that by the age of 20 he had sailed extens­ively. He went to the Caribbean and the death rate was high, res­ult­ing in him being pro­moted to cap­tain by the age of 20. He was a very enthu­si­astic officer which guar­an­teed his career and whilst he was in the West Indies he mar­ried an afflu­ent widow. He craved for action and was driven by glory. He was noted for his inspir­a­tional lead­er­ship, superb grasp of strategy and uncon­ven­tional tac­tics. During his career he spent many years at sea but only fought about five battles. • The Battle of Cape St Vincent, which he won. • The Battle of Santa Cruz de Tenerife, where he was defeated and lost his right arm. • The Battle of The Nile against the French, which was a decis­ive vic­tory. • The Battle of Copenhagen against the Danes which he won. • The Battle of Trafalgar in which he was fatally wounded and died after the vic­tory. Wellington’s first taste of war was under the com­mand of the Duke of York and it was a very bad exper­i­ence due to the bund­ling of the senior officers but as Wellington said, that was where he learned what not to do. He had an exem­plary battle record and par­ti­cip­ated in over 60 cam­paigns during the course of his career. He was famous for his adapt­ive defens­ive style of war­fare which gave him vic­tory over foes that had numer­ic­ally super­ior forces with the min­imum of losses on his side. 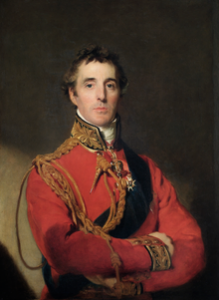 Sir Arthur Wellesley The 1st Duke of Wellington. The two men only met once and that was in an outer office 7 weeks before the battle of Trafalgar. Nelson was 11 years older than Wellington and the con­ver­sa­tion was totally one sided. He went into the inner office and asked who the young officer was out­side and he then returned and car­ried on the con­ver­sa­tion, but this time on equal terms. 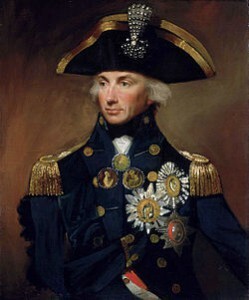 Wellington never saw him again because Nelson was killed seven weeks later at Trafalgar. Nelson died at the age of 47, a hero and Wellington car­ried on to be a politi­cian and a states­man and died at the age of 84. Nelson was famous for the Battle of Trafalgar and Wellington was famous for the Battle of Waterloo. I just wonder, if Nelson had lived on into his 80s and if Wellington had died at Waterloo at the age of 46, would we have Waterloo Square and Wellington’s Column? If you would like more details about these two heroes and Professor Bruce Collins you can find them by click­ing on their pho­to­graphs. It was a very enjoy­able and edu­ca­tional morn­ing and I look for­ward to another talk by the pro­fessor. Previous PostThe Royal Navy — 9th November 2015Next PostSheffield Castle, Park, and Manor Lodge — David Templeton — 23rd November 2015.